You can manage tiles of a Windows Phone application in several ways. You can setup the tile with a remote image URI that will be fetched and updated by the system. This is useful for example when the same tile is pushed to many users (for example in a news reader app). 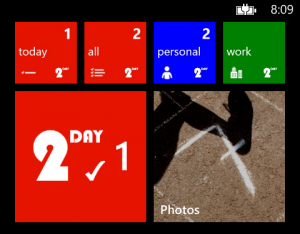 You can also setup the tile with a local image. In that case, you can generate the image dynamically on the phone based on specific user’s information. The problem I had was that after my app was suspended, it wasn’t able to start over with fast-resume. The app was stuck in a “Resuming…” dialog. After several hours tweaking the code, I found out the issue disappeared when I removed the code which updated the live tile… Strange isn’t it ? Tweaking more the code, I found out it was the use of the WritableBitmap that was the cause of this issue. I searched over the Internet for a couple of days, asked in new dedicated topics on MSDN forums but no one had a solution. I finally decided to move the code which updates the tiles from the Deactivated event of the Application to the OnNavigatedFrom method of the main page of my app. I’m not sure what is causing the problem… but it looks like I’m not the only one facing it as I was contacted on Twitter about the problem. // do livetile stuff here. Thanks for the feedback Ryan !